Banff gets warm at Wild Flour. Come to Wild Flour for your weekly pantry of sandwich loaves, crusty baguettes, treats, and croissants. For the best coffee anywhere. For hot soup and good company on a chilly day. And to see the very best of this place that we love so much: friends gathering around steamy mugs in the most extraordinary little mountain town in the world. We are authentically local and independent, with a bustling neighbourhood feel. Our staff is friendly, knowledgeable, and passionate about the warmth of Wild Flour. Find us in the popular Bison Courtyard in the heart of downtown Banff. Enjoy artisan bread and pastries baked fresh everyday. We make organic, local, healthy, and nourishing food for everyone. We are a quick stop or a lingering lunch. We are in the middle of it all, and we love this place. The people of Banff have come to this spot seeking warm, nourishing comfort food since the late 1800s. We feel that lineage every morning. We're devoted to our cornerstones—loaves and baguettes of rye, sourdough, whole wheat, and gluten-reduced blends—but we're also devoted to play. We incorporate the best of our local mountain bounty in fruit, cheese, nuts and seeds. As we mix, measure, and knead, we see friends meeting here. This place has a heartbeat, and we love the community that collects around the warmth of our ovens. We accompany our bread with everything else that makes for great comfort and conversation: hearty breakfasts, delicious soups, warm sandwiches, and—of course—excellent coffee. We are independent, proud, and passionate. Energy rises into art. This is what we love. 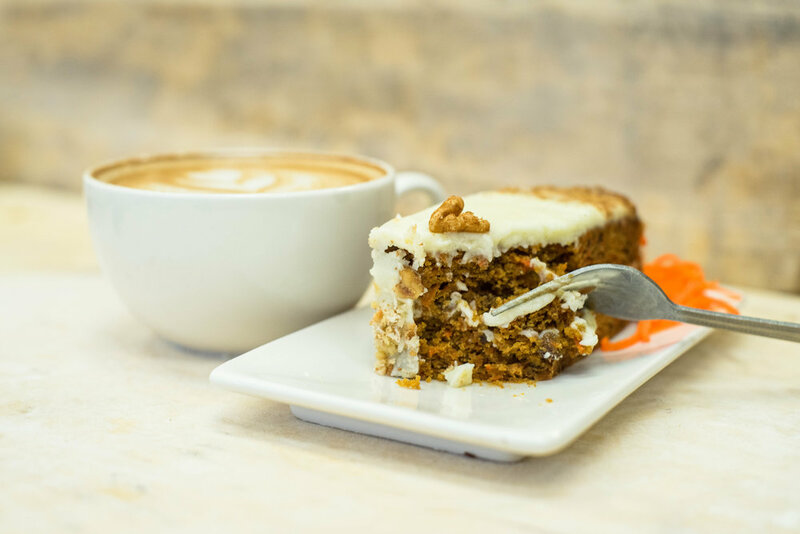 For early-risers on the way to yoga or for those slow-morning folks who like to come in and stay for a while, we've got your morning brewed and baked. We use free-range eggs, fresh vegetables and herbs, and bakery-fresh bread for our signature breakfast frittata sandwich, and our variety of housemade granolas can be topped with berry compote and yogurt or milk. Start your day by choosing from an array of delicious whole and healthy foods made with love—just as you like it. Take your lunch to the next level with our daily sandwich specials, which feature locally produced Valbella deli meats or tasty vegan fillings between slices of freshly baked bread. You can also enjoy our gooey gourmet grilled cheese or our locals' favourite topped focaccia, available from 11:30 am daily. 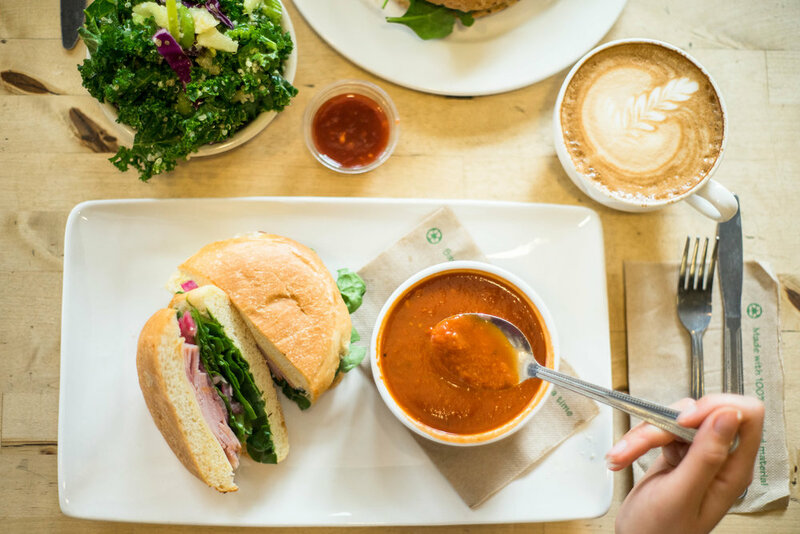 For a lighter bite, we offer fresh-daily soups and salads—many wheat-free and vegan—such as our kale and quinoa with salad with apple, or our warming yam masala soup. Whether you're craving chocolate, a muffin, or something decadent, we've got your treats. Choose from our daily case of croissants, cookies, cakes, brownies, bars and tarts. At Wild Flour, we're passionate about the art of leavening. 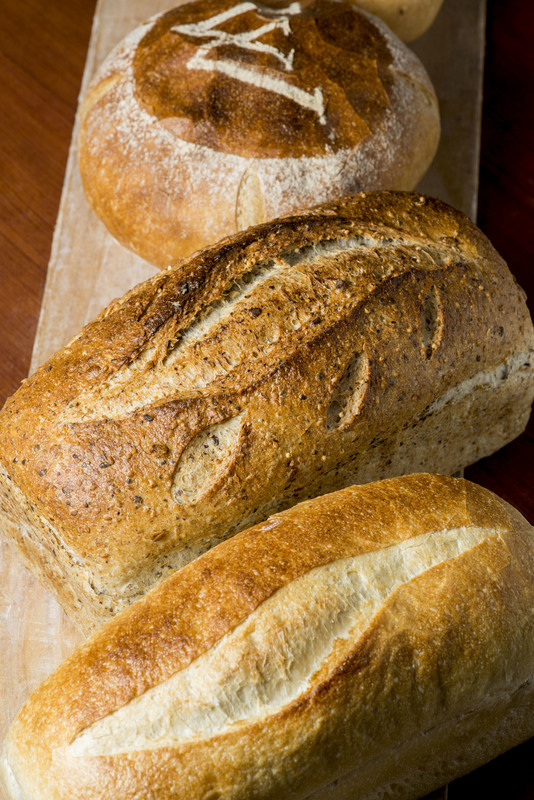 Every day, our shelves are stacked with cooling sourdoughs, mixed-grain loaves, and baguettes. We use only the best organic flours and natural starters, and bake in our stone hearth oven for a crunchy crust and substantial dough. Our bakers get creative with daily specialties like Cranberry Walnut Rye and Cheddar Levain, plus our gluten-reduced mixed grain loaves available every Thursday. Check out our full Bread Schedule to find your favourites. Pick up a little something extra! Our selection of reusable bread and tote bags, water bottles, Keep Cups and stainless steel straws will help you waste less and be kind to the planet. Plus you can take a little taste of the Wild Flour home with you. As well as a freshly baked loaf, grab a bag of locally roasted and ethically sourced coffee beans, a jar of delicious Om butter or our delicious house made granola. These are souvenirs and gifts you can really feel good about. Looking for a delicious way to celebrate a special occasion, or the perfect dinner party dessert? Bring home the taste of the Wild Flour with one of our special order full-size cakes. Moist carrot cake topped with rich cream cheese frosting and walnuts. Serves 8-10. Decadently rich chocolate torte, with a crunchy hazelnut base that's also gluten-reduced. Serves 10. Please note that we need a minimum of 24 hours to fulfil cake orders, and this may be longer during busy periods. To place an order, please call (1) 403 - 760- 5074 or visit the bakery. Email enquiries may be directed to baking@wildflourbakery.ca, however response times may vary and orders are not confirmed until you have received a reply from us. For orders less than one week in advance, please contact us by phone. Connect with us on Social Media for all the latest news!